The Mediterranean flour moth, Indian flour moth or mill moth (Ephestia kuehniella) is a moth of the family Pyralidae. It is a common pest of dry plant produce – especially cereals – and found around the world. 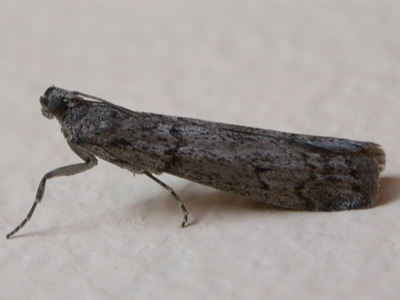 The adult moth is pale gray and up to 12 mm long, with dark bands. The hindwings are grayish-white. The wingspan is between 16 mm and 20 mm. The larva (caterpillar) is off-white with a darker head and small black spots on its body. 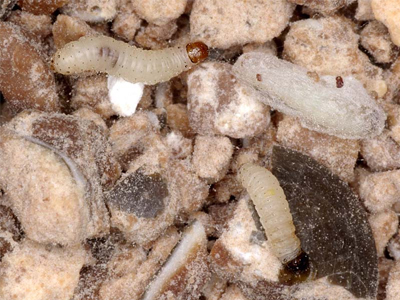 The larva emerge from tube-like structures about 7 days after they hatch. The larva is about 12 mm long when mature. The larva then find a place to spin a cocoon. When the larva spin cocoons, they turn to a reddish-brown color. 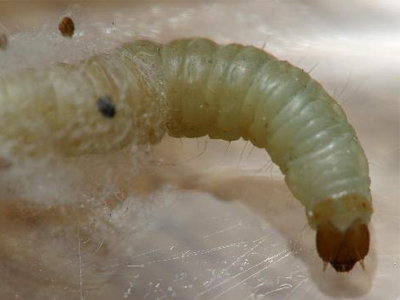 It takes about 8–12 days for the larva to become a moth and it takes 2–4 weeks for the egg to become an adult. The female moth lays 120–680 small white eggs. These eggs commonly attach to food and they hatch within 3–8 days. The caterpillars are often found feeding on flour, cereals, baked goods and other dry grain products in food storage areas. Less often, dried fruits or mushrooms and even peat or rotting wood may be eaten. The species may reach extreme population densities in suitable locations (such as gristmills) if left uncontrolled, and the silken webs produced by the caterpillars may even interfere with normal operations of machinery such as flour sieves. The adult moths do not feed. As with most grain- or flour-feeding pests, the most effective method of control is to adopt basic good sanitary practices. Clean all infested surfaces with white vinegar. One way to keep the moths away is to place bay leaves in the food containers along with the original grains. Products already affected should still be thrown away. It is essential to ensure that food storage areas are kept clean and tidy and that no residues are left over. In addition it is imperative that food – especially grain, sugar and flour – is kept in plastic or metal storage containers with tight fitting lids. This will stop flour moths and other pests from getting at their contents. Contact your pest management professional and request an inspection, to prepare a comprehensive pest management plan that will effectively and efficiently deal with the specific pest problem. Almobidoon ® copyright © 2019, all rights reserved.